I recently read a thread on reddit titled “A Privacy & Security Concern Regarding GNOME Software” that addressed a few issues regarding the fwupd daemon. The developer eventually responded and was able to justify and debunk most of the claims made against his software. However, that prompted me to have a closer look at the traffic originating from GNOME Software. On Arch Linux, the fwupd plugin is an optional dependency of GNOME Software so that part did not concern me. I did however notice a lot of outbound traffic headed to the IP address 8.43.85.9. 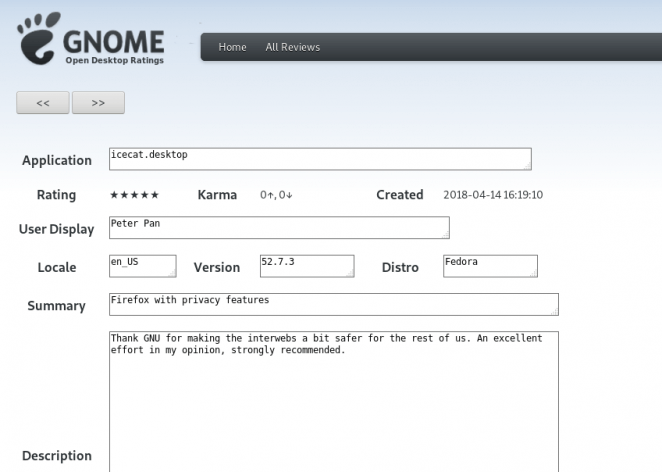 This IP address is owned by Red Hart and hosts a service called “GNOME Open Desktop Ratings” on behalf of the GNOME Project. Surely GNOME Software will notify me in detail as to what data it’s collecting and how it will be used before accepting my application review? To find out if that was indeed the case, I downloaded the latest Fedora release to get a build with GNOME Software the way Red Hat intended. Submitting a review from GNOME Software on Fedora 27. My icecat review available on odrs.gnome.org. I kind of expected this behavior so I registered a local user account with the name of Peter Pan as I had no intention of having odrs.gnome.org dox me that easily ;-) I don’t much appreciate this kind of behavior from any software, even if I happened to post the application review of my own free will. In the end, I was never made aware of, or agreed to any personal data being collected from my system and sent to an external service. If you still want to use GNOME Software on Arch Linux I would recommend disabling the review system altogether using ABS. After spending some time trying to figure out why my right touchpad button no longer worked, I must confess I found the reason to be rather amusing. So, it doesn't work because the Gnome developers believe the "right way" to right-click is by using two fingers. So I was minding my own business while connected to my VPN service when I noticed several blocked outbound network connections appearing in my firewall log. For some reason my wifi adapter (wlp3s0) was trying to connect directly to the internet without having traffic routed through my VPN interface (tun0). Was this my reward for not reviewing AUR PKGBUILD files, or was there another explanation as to why wlp3s0 wanted to disclose my real IP address?